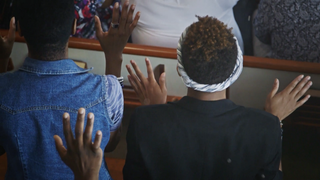 The battleground in the fight for lesbian, gay, bisexual and transgender rights and acceptance is moving from the courts to the church, where a stubborn, intransigent homophobia has profoundly affected many of its African-American members. Journalist Cane, a veteran film critic and entertainment editor at BET.com, chose this subject for his first film, a 60-minute documentary on the complex situation that exists between the African-American church and its LGBT population. The film premieres Tuesday on BET.com and the BET Now app, and that same evening, there will be a special screening at New York University’s LGBT student center. Cane has written on a variety of cultural subjects, often focusing on homophobia, for several outlets (including The Root), and as this particular story grew and became more nuanced, he sought the larger format of documentary cinema for its telling. The film was realized quickly. He wrote the proposal in winter, shot in Atlanta in May and finished the film for release this month. But the speed doesn’t mean that it was an easy film to make. She continues, “I can’t ever believe that God makes mistakes like that. We have to understand that we are engaged in spiritual warfare.” It’s that level of candor that makes the film so riveting. The film gives Tonyka ample room to respond about the difficulty of living honestly and being rejected by her family and their church. The film is equally powerful and probing in dealing with gays who have remained in the church and their contradictions. For instance, Charles Anthony, the minister of music at the historic Ebenezer Baptist Church in Atlanta, speaks in a soft, almost cracking voice about the need to be where he felt God sent him, though he lacks a sense of affirmation from his peers. The film moves seamlessly from its bold-faced, stop-you-in-your-tracks quotes to tender storytelling. As is typically the case with great documentary cinema, it leaves you with a better grasp of an essential issue and a sense of the next steps in the situation. Cane says that he intends to continue following the story but that making this film has whet his appetite for cinema. “I love telling people’s stories,” he said, “and there are many more to tell."